PANORAMIC VIEWS of the Pacific Ocean and the city skyline of Long Beach from every room! Desirable corner location with a wrap around glass balcony on the 7th floor of the prestigious Aqua Towers. This home embraces all the luxuries a sophisticated buyer with impeccable taste will appreciate. An open floor plan with soaring 10â ceilings and 8â windows will greet you as you step through your door. 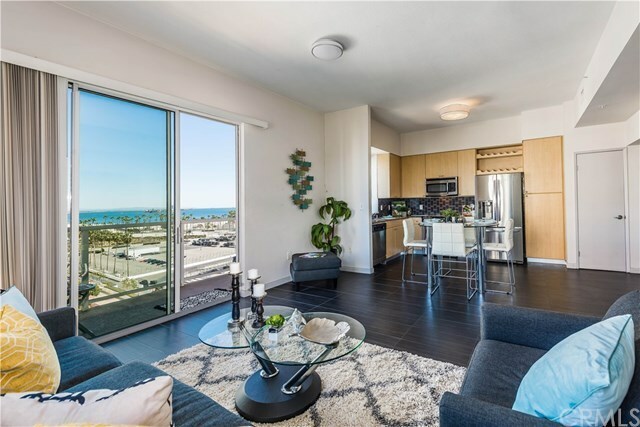 The kitchen boasts natural granite counter tops with tile backsplash, custom cabinets with pantry, upgraded GE stainless steel appliances, slate flooring and don't miss the ocean view as you wash your dishes from the kitchen window. Upgraded bathrooms are finished with crema Marfil marble floors and tub surroundings, cabinets with granite countertops and oversized soaking tubs with shower. Master suite has an overhead ceiling fan, large walk in closet and a private glass terrace with a city view.Â Washer and dryer is included and conveniently located within the unit.Â Covered and gated parking for residents and guests. At Aqua, your in the heart of Long Beach, walking distance to the beach, biking trails, metro lines, Shoreline Village, The Pike, Pine Ave, Queen Mary & LB Grand Prix. Aqua Amenities include water, trash, internet, 24/7 Security concierge, fitness center, pool, spa, BBQ area, sauna and club room with a business ctr. Itâs time to stop dreaming and start living. Your home search is now over!